This book is the perfect example of why I should listen to my brain about a book instead of my heart. My heart told me: they use books to pull things through into our world. My heart also told me that the author is an amazing person (which he is) and that I should read all his books in support. So, listening to my heart instead of my brain, I read it. And, honestly, was mostly bored through it. Sure, there were things I liked and things I didn't, but my overwhelming thoughts are of indifference and, while I was reading it, wondering when it would be over. 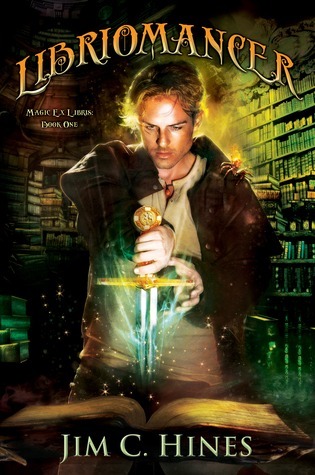 I can definitely see this book appealing to people that already like urban fantasy. The idea behind the world building - basically that certain people can reach into books and draw things out - is inventive and super creative. Though more than once it also left me feeling that that was too easy. I have no complaints about Isaac, which in and of itself is unusual. He's got several fairly typical traits of UF main males - such as his snark and his getting beat up. (I've given it my all, but now I have to dig even deeper and give just a little bit more.) But no, don't worry, he's okay. (Though his beating is more mental than physical.) But, he's a nice guy, with a great sense of humor and he'd be someone fun to hang out with. At least once everyone and their grandmothers stopped trying to kill him. I also love the fire-spider, Smudge. And I HATE spiders. Seriously, the creepy crawly things are just ugh. But, Smudge is so great that I was left kind of wanting one for a pet. Then there's the requisite love interest. Who, thankfully enough, isn't just a love interest. (Unlike most other UF books I've read.) Looking at Lena objectively, she's a compelling character - and there's plenty of opportunities for a 'free-will' argument/discussion with her. She is also NOT stick thin. However, and I think this is partially because of what she is, I've failed to get attached to her. The plot is pretty typical. A bit of a war breaking out between vampires and our select group of magic users. Things are kept from being too predictable by the fact that there are a whole passel of different 'breeds' of vampires. Sometimes I definitely though there were too many, but it does make some sense. And there's indications that all is not as it seems. While reading the book, a head/heart battle started again. Only this time it was over me knowing objectively that the book is probably good for UF fans, and me not really liking it much.